In 2012, Her Majesty the Queen and the nation will be celebrating her Diamond Jubilee for 60 years as Britain's Ruling Monarch. The Queen's Coronation took place on 2nd June 1953 after The Queen came to the throne on 6th February 1952. The Queen celebrated her Silver Jubilee (25 years) in 1977 and her Golden Jubilee (50 years) in 2002. The only other British monarch to celebrate a Diamond Jubilee was Queen Victoria in 1897. The celebrations will centre around early June 2012 (2nd, 3rd, 4th, 5th). The Government has announced its plans for a special four-day Jubilee weekend which will allow communities the time to come together to celebrate and commemorate the events of the last 60 years. This has involved putting back the late May bank holiday to Monday 4 June and adding an additional Jubilee bank holiday on Tuesday 5 June. This website aims to celebrate this historic event by reporting on the lead up to the celebrations. 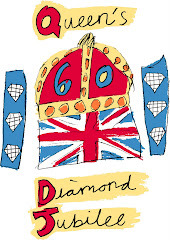 We will endeavour to provide useful information that will help you to celebrate The Queen's Diamond Jubilee. This site is an unofficial guide and not connected in any way with the Royal Family or any of its websites.